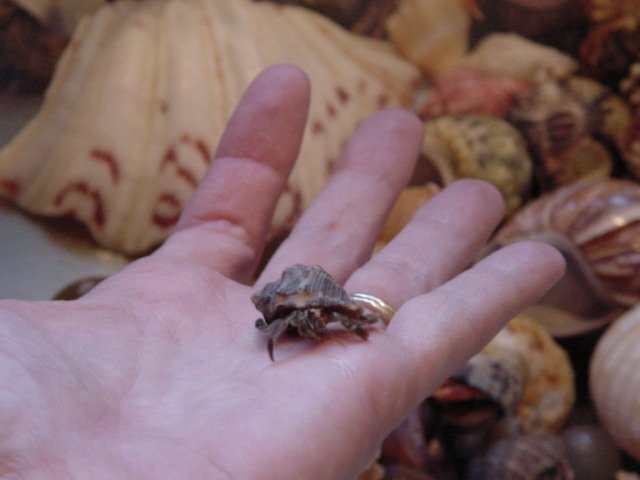 While handling your hermit crabs, pick them up by the shell and place them onto your palm ,fingers extended or in the flat position, daily, in order to get them use to you. This way the hermit crabs will not just grab out and take a hold of your skin and nip you with their big feeder claw. If they feel insecure they will grab whatever they can, to stay onto the object whare they are presenty, so don’t be alarmed if you were pinched once. You can try again later. Just be sure you give them no reason to feel insecure while being handled. Sometimes the insecurity is from past experiences at the place where they currently lived. Hermit crabs go through a lot of handling and such while being mailed from place to place and it can cause quite a bit of stress and edginess. By time they get to the pet store where you found them, they may have been through 3 or more shipping procedures. Just give yourself and your hermit crab time and the more you handle them you will get to know each other. The insecurities that you hermit crab seems to have will eventually go away and you will find that there is a trust that develops through the time that you spend together. Do not grab the crab and pull it off. It is best to place your crab and hand under lukewarm running water. This way may not be as quick, but in the end, you and your crab will have less injuries than you would have had otherwise. Ah ha! I have just experienced something I never thought would happen! Or should I say, my 1 and a half yr old son did. We were just at a shop that sells hermies the other day, and he put his little finger right into his Big feeder claw. The thing wouldn't let go for over 10 minutes, and it had a good strong hold on him. We tried the water, and for this crab, it did not work. I finally had to ask someone in the store for a pin, and when I finally got the pin, I wedged it inbetween the pincher's grasp, then I pryed it open. My poor little baby has a wound to prove his silly antics and it still hurts. The crab was not any bigger than a quarter in size, but his grasp was firm. I just thought that I would pass my "pin method" along in case any of you ever experience a "determined to hang" on hermie.